Rum night: 2 rather obscure bottles, the first due to time, the second because it is from an ‘open’ closed rum distillery in Guyana. The Rhum St. Andrews expression is an old one, from what I can tell, bottled by the Italian company Branca for the Italian market from the 1930s to possibly early 60s. Upon closer inspection, a trusted source puts this particular bottle as from the 40s/50s. The source is believed to be the French West Antilles. Since this is a Rhum, we expect the contents to be derived from agricole ie French style distilled cane juice as opposed to English style distilled molasses, though one cannot be sure what else was blended in at that time. Very little else is known about this rhum, which is expected given the sheer passage of time. There seems to be several presentations for this bottle, ours comes without the netting and funny cork, but has a very interested tax label. Note that this particular Rhum has been in glass for something like 70 years maybe. Nose: Rather smooth and honestly a bit on the weak side. Not surprising given it has spent so long in glass and was bottled at a low low 45%. Nonetheless – rummy markers are clear: A caney fibrous sweetness, peanut toffee caramel thick thick caramel at that. Deep rich and sweet. Just a tiny bit of chest rub, lots and lots of wood. Molasses – yes even though this is agricole, and stewed berries. Hmm just a bit of soy sauce and capers. On the whole a much sweeter smoother style than the phenolic more extreme style one might find in Trinidad for example. Palate: Prune juice! and mentholated spirit, with some sort of thick plum eau de vie. Surprisingly vigorous despite its more sedate nose. Sweet dark stewed notes. Also a bit more of that mentholated chest rub. Still alive after all these years! Finish: Long, woody, burnt toffee, fibrous cane again. Probably not at its peak, which is sad, it is just too feeble at this age. Still pretty good, and consider the provenance. Yes Duncan Taylor does bottle Rums, so does Cadenhead and Samaroli. In fact theirs are usually good and worth seeking out. Uitvlugt (eye-flut) is a rum distillery on Guyana. 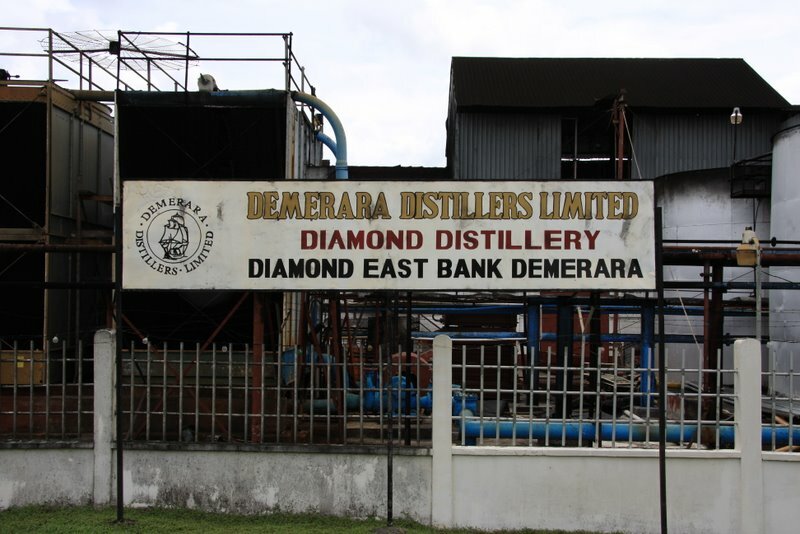 The rum story in Guyana is one of consolidation – where sugar estates once had their own bespoke distilleries with names like Enmore, Diamond, Port Morant, Versailles and Uitvlugt, these names now only live on as expressions bottled by the Diamond Distillery Company – The lone survivor of the downsized sugar industry. 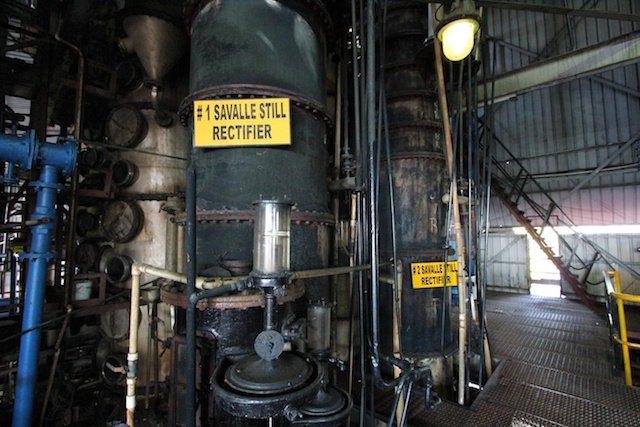 Fortunately in Guyana, each time a distillery is bought out or merged, the stills were dismantled and brought over to Diamond. Hence a menagerie of stills live on to distill expressions bearing the name of their previous estates, or otherwise blended for Diamond’s core range. In the case of Uitvugt, the end came in 2000, after which the famous four column French Savalle stills were moved to Diamond. This rum was distilled in 1998, meaning the old distillery, something increasingly rare now. A word on the four column French Savalle stills. Savalle are a French maker of stills. In the whisky world, you would commonly see a pair of column stills called the Analyser and Rectifier columns, but here the unique 4 still set up includes a Boiling and Aldehyde column inbetween. It is said the various permutations of column use would allow up to 9 different rums being produced, though this bottle does not indicate what style went into this cask. Nose: Amazingly, the american oak arrives first and it’s quite forward. Vanilla, custard, creamy wood. Not unlike a bourbon-reliant scotch. But the rum is just a step behind, and it shows a lighter, gentler, more civilized style compared to the monster that is Port Morant. There are still some fibrous cane notes, but lots of white sugar heated to the point of melting. Much fresher with cararway or fennel, or some tossed sour green herbs a hipster chef might use in some crazy deconstruction. Palate: All about the rum here. Again a much fresher lighter style with much less esters than a heavy Port Morant, with cleaner sour green and sour herby notes that were already present on the nose. White sugar. Some hotness and spiritiness too, more akin to some stone fruit spirit. Touch of kiwis? Not hugely complex but clean easy drinking. Finish: Medium, rummy, vegetal notes. Malt equivalent? I’ld say Bladnoch or Auchentoshan. This entry was posted on July 17, 2016 by Whiskyrific in Rum, Uitvlugt and tagged Demerera, Diamond, Guyana, Rhum, St.Andrews, Uitvlugt.